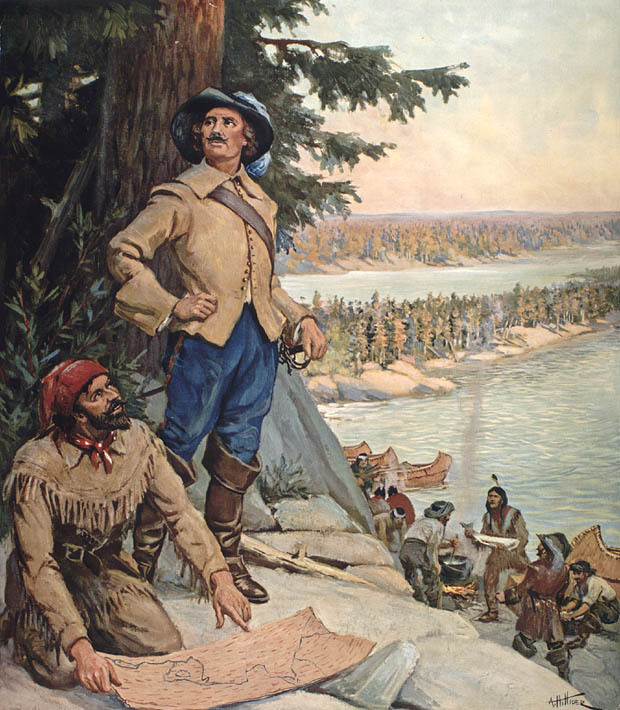 In 1608 Samuel de Champlain, considered the founder of New France, erected a habitation (building) at Québec. He continued Cartier’s dream of finding an opening to the Indies, pursued the commercial interests of businessmen in France, his sponsors, and followed the king’s wishes. The settlement responded to economic demands: go out to the fur-rich areas, forge close contact with suppliers and try to obtain the right of exploitation. The scale of the operation made it necessary to form private companies. Here it’s a drawing of the habitation at Québec made by Champlain. In here it shows a battle with Champlain and the Alguonquin against the Iroquois. In this image it shows a picture of the coureurs de bois travelling to explore the Great Lakes region. Here it shows Champlain forced to surrender in 1629 by the English. Between 1634 and 1650, the Jesuits established missions in New France along the Saint Lawrence River. They soon moved deeper into the colony’s territory in order to live with and convert the local Huron population. During this time, however, their missionary efforts were fraught with disappointment and frustration. In other colonies, such as in Latin America, the Jesuit missions had found a more eager and receptive audience to Christianity, the result of a chaotic atmosphere of violence and conquest. But in New France, where French authority and coercive powers did not extend far and where French settlement was sparse, the Jesuits found conversion far more difficult. Nevertheless, the French missionary settlements were integral to maintaining political, economic, and military ties with the Huron and other native peoples in the region. The contact between the two had important consequences in lifestyle, social and cultural attitudes, as well as in spiritual practice. The French Jesuits and Huron found they had to negotiate their religious, social, and cultural differences in order to accommodate one another. 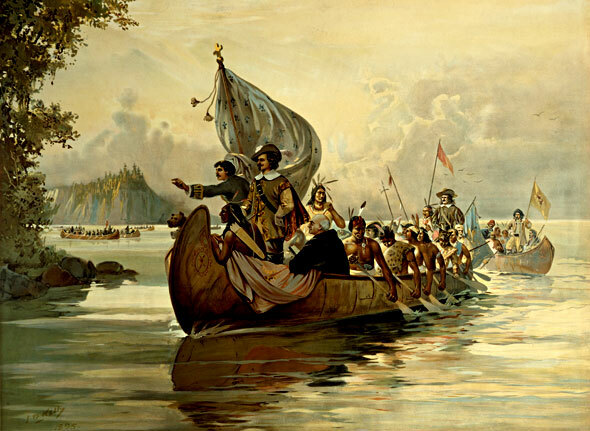 This picture shows the Wendake with Champlain in a boat travelling the rivers and lakes of New France. 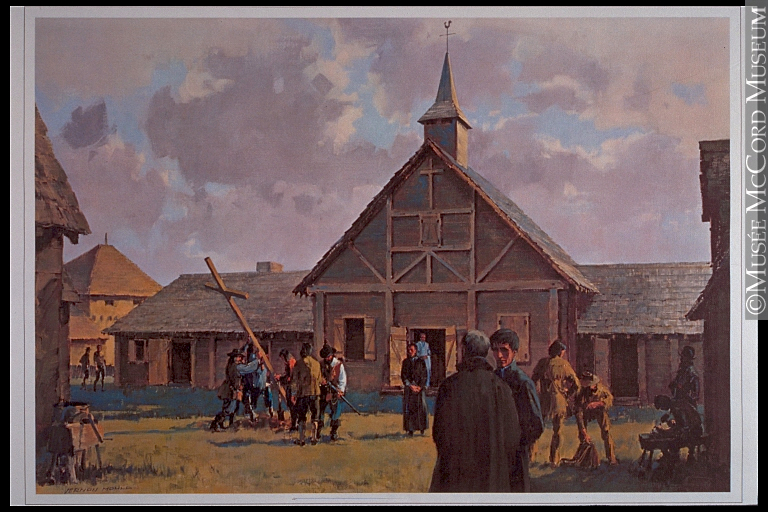 In this image it shows workers building the church at the Jesuit mission of Sainte-Marie among the Hurons. In here it shows a picture of how the Iroquois attacked the Wendake in 1649 to 1650. The Governor of New France was the viceroy of the King of France in North America. A French noble, he was appointed to govern the colonies of New France, which included Canada, Acadia and Louisiana. The residence of the Governor was at the Chateau St-Louis in the capital of Quebec City. Acadia, Louisiana, and the towns of Trois-Rivières and Montreal had their own particular governors. Prior to the establishment of the 1663 Sovereign Council, the highest positions in New France were that of Governor and Lieutenant-General, which were often held by the same person. The Governor then had responsibilities over both military and civil affairs in the colonies. With the new royal administration of 1663, the title of Governor General was given to the person responsible for the military and diplomatic relations. The administration of justice, police, and finance was given to the Intendant, who presided over the Sovereign Council. The Governor General answered to the French Secretary of State of the Navy and the Controller General of Finance. 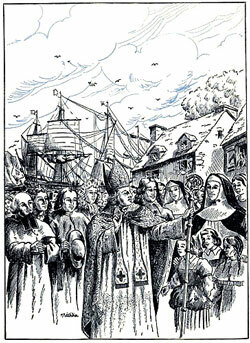 The bishop of New France is responsible for religious affairs. In here it shows Jean Talon telling the women If they like their home. The mercantilism was a popular idea in Europe in the 16th century because they could sell some items to other countries of the world, they were not permitted to sell their raw materials to anyone but the home country. A coureur des bois (French pronunciation: ​[kuʁœʁ de bwa]) or coureur de bois (French pronunciation: ​[kuʁœʁ də bwa], runner of the woods; plural: coureurs de bois) was an independent entrepreneurial French-Canadian woodsman who traveled in New France and the interior of North America. They ventured into the woods usually to trade various European items for furs, and along the way they learned the trades and practices of the Native people. These expeditions were fuelled by the beginning of the fur trade in the North American interior. Trade began with coat beaver, but as the market grew coureurs de bois were trapping and trading prime beavers to be felted in Europe. The Coureurs de bois travelled to get more fur and explore the Great Lakes Region. La Verendrye was a group of men who went west across the prairies and had established many trading posts. This is a map of how the Coureurs de bois travelled and traded. The seigneurial system was an institutional form of land distribution established in New France in 1627 and officially abolished in 1854. In New France, 80 per cent of the population lived in rural areas governed by this system of land distribution and occupation. In principle, the seigneur granted a piece of land to a family under a royalty system. The family would engage in subsistence farming to meet most of their food, heating, and shelter needs. The seigneurial system was based on the feudal system, which involved the personal dependency of censitaires (tenants) on the seigneur. 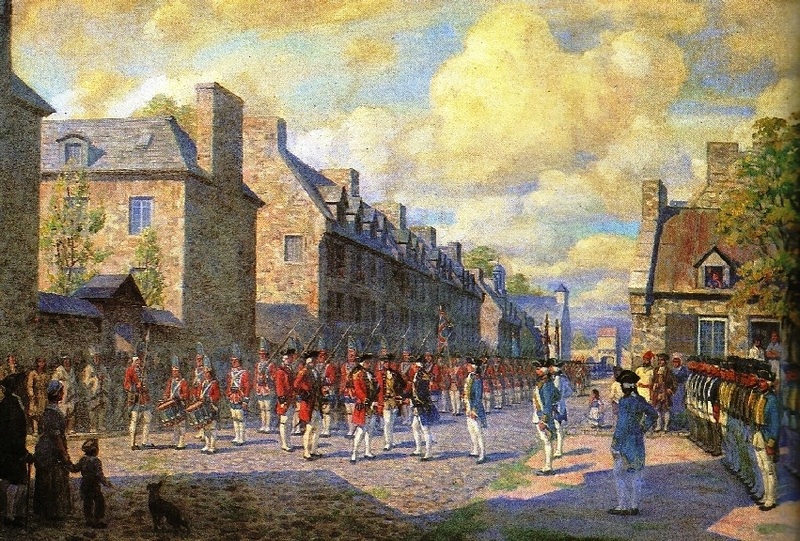 In New France the similarities ended with occupation of land and payment of certain dues. The tenant was normally referred to as a habitant. 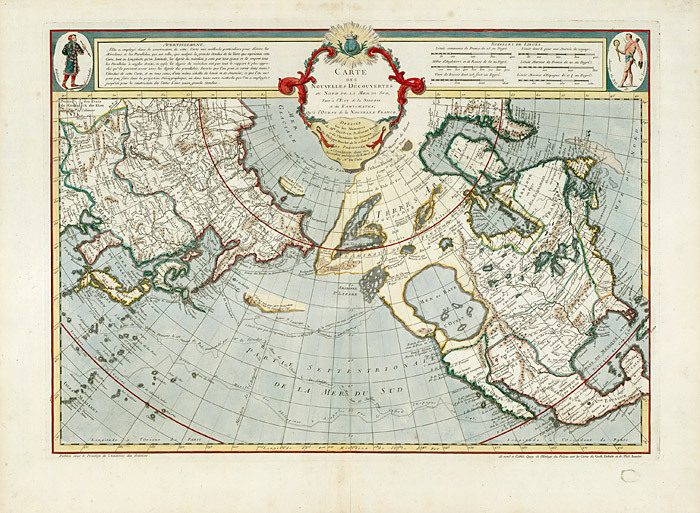 The Compagnie des Cent-Associés, which was granted ownership and legal and seigneurial rights over New France, from the Arctic to Florida, also obtained the right to allocate the land to its best advantage. The land was therefore granted as fiefs and seigneuries to the most influential colonists who, in turn, granted tenancies. In this image it shows habitants having a good time playing cards, smoking tobacco, and drinking beer. All seigneuries had a church nearby, and the Catholic priest was a very familiar authority figure in the community. 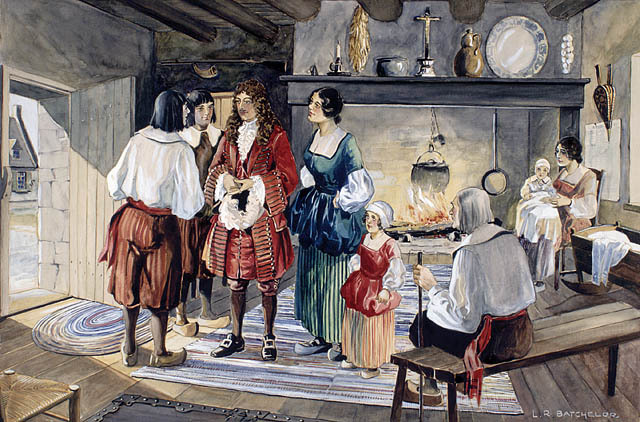 In the early days, very few French women came to New France, the fur traders were encouraged to marry First Nations women. Here it shows a map of how the seigneurial system worked in New France. When the British came to New France, they decided to take over the French Imperialism and Conflict, this lead to a battle were the English and the French are battling for power and who takes all North America. Here it shows a battle of the English defeating the French between imperialism and conflict. This is a picture of the seven years war between France and Engalnd. The Seven Years’ War, also known as the French and Indian War, began in 1756 when the fighting between French and colonists merged into a European conflict involving France, Austria, and Russia against Prussia and Britain. The French and Indian war took place in the American theater of the global Seven Years War; the Treaty of Paris marked the end of the Seven Years War in 1763. The Acadians were devastated that they had to migrate by force, 11 000 Acadians were expelled and about 1700 died at sea. A map of the Imperialism and conflict in New France. The Seven Years’ War was fought from 1756-63. The first war to span the globe, it was chiefly fought between Britain, Prussia and Hanover, against France, Austria, Sweden, Saxony, Russia and Spain. France and Britain were especially hostile enemies, waging war on land and sea in Europe and in colonies around the world. Britain hoped to destroy France’s navy and merchant fleet, take possession of its colonies and remove France as a commercial rival. Much of the fighting took place in North America, where the European powers clashed over possession of their colonies. The North American theatre is also known as the French and Indian War. 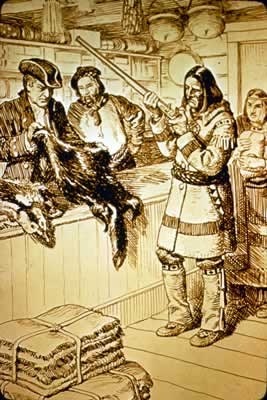 British and French wanted control of the fur trade in the area west of the Rocky Mountains and in the Ohio Valley. British and French wanted control of the fishing areas in the Atlantic. Here it shows the death of General Wolfe in the Battle of the Plains of Abraham. In this image it shows the British surrounding Montreal cities, the British had won the Seven Years War. The Treaty of Paris is the consequence that ended the Seven Years War. In this comic I made a chimney swept in the 19th century, it takes place in a factory with a man watching the kid swept the chimney for complete. The French Revolution started when the Estates General would include representatives from all three estates. They met in the Tennis Court Oath. Louis was eventually forced to order the First & Second estates to join the National Assembly and create a new government. The revolution had just begun. The three most significance events in the French Revolution were the Fall of Bastille, The Execution of Louis XVI, and the Reign of Terror and Committee of Public Safety. The Fall of Bastille was significant because the people of France were showing how they were powerful by destroying Bastille and taking power away from Louis. The Fall of Bastille is also important because in July of 1789 it says that the French people were mad that the meeting on the National Assembly and Tennis Court oath went bad. The immediate problems of starvation and poverty had not been addressed, and the cost of living in Paris and other French cities increased. A lot of people in France were really hungry and started to steal bread from others. They also started to break into bakeries and steal all the bread they could get. 2% of the people of France died of hunger. The people of France went to Bastille to attack and the mob killed the prison governor. When Bastille was destroyed, it frightened Louis. He dismissed the mercenary soldiers; Louis lost power and the people of France gained power. The Execution of Louis was significant because he was found guilty on 1793 by a total of 33 charges. Louis had to be executed by the guillotine on January 21st, 1793. The Constitution of 1791 actually protected the monarch from anything worse than dethronement. Louis tried to defend himself by stating that he intended to become a constitutional monarch, but it was hard to prove. His use of foreign mercenaries before the Fall of Bastille and his attempt to escape France in 1791 were declared to be acts of treason against the people of France. Louis was found guilty and his punishment was death. He was executed by the guillotine on January 21, 1793. On his way to be executed, a man on horseback in the national uniform gave a ferocious cry ordering the drums to beat. They dragged Louis under the giant knife of the guillotine, which with one stroke severed his head from his body. The Reign of Terror and Committee of Public Safety was significant because a lot of people were executed by Robespierre’s rule. At The Reign of Terror from 1793 to 1794, the revolutionary government was controlled by the Committee of Public Safety. This. period became known as the Reign of Terror. The French government provided free primary education, assistance for the poor, price controls, taxes based on income, metric system, abolished in the colonies. The Repubic and Reign of Terror was when Robespierre made unfair and harsh laws, and whoever disagreed with the laws would be arrested and executed under the guillotine. It’s believed that at least 17,000 people and perhaps as many as 30,000 were executed under Robespierre’s rule. Even though there were many events in the French Revolution, the Fall of Bastille was the most significant because when the people of France demolished Bastille, they showed Louis that they have power. The French Revolution in the 1780’s to the 1790’s was a really bad time because a lot of people were executed by the guillotine or killed in many events, no one would like to live in the French Revolution. The Stamp Act of 1765 was a different kind of tax. 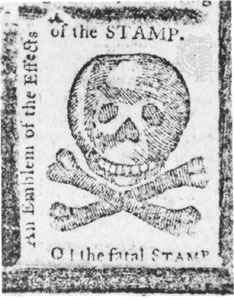 The Stamp Act came just two years after the official end of the Seven Years War. The act was a disaster, and everyone knew it, it was repealed in 1766. The Stamp Act was similar to the sugar act, only this time instead of sugar that was being produced the French West Indies, they used taxing people to collect money from people in the U.S.A. The British prime minister imposed these taxes for two direct reasons: The first reason was for the colonies to defend their empire, and their second reason was to determined their assert British sovereignty and their representative assemblies. In 1767, parliament imposed aseries of new taxes that came to be known as the Townshend. It seemed that the real intent behind the Townshend Acts was to prove to the Americans that Britain still had the right and the authority to tax the colonies. Bernard of Massachusetts dissolved the legislature when a Circular Letter describing the measures it had taken against the Townshend Acts. The Circular Letter was led to a series of Non-Importation Agreements. 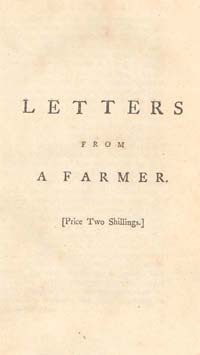 Dickinson’s Letters from a Farmer in Pennsylvania. As more open resistance grew, British troops were stationed throughout the Thirteen Colonies. In 1770, nervous British soldiers misunderstood an order and fired their muskets into a mob of protestors in Boston, killign several people. The people in the Boston Massacre were mad because the British empire kept their government in the UK and because they wanted their money for war, when the Boston Massacre was over two people were wounded because of the sustained in the incident. In here it is showing the British soldiers scarying the American people because they thrown snowballs to the British soldiers, the British soldiers reacted violently by killing five people and leaving the rest of them running away. On June 13, 1775, the leaders of the colonial forces attacking Boston knew that the British were planning to send troops out from the city to make a barrier on the unoccupied hills surrounding the city, giving the Americans control of Boston Harbor. The 1,200 colonial troops were under the command of William Prescott stealthily occupied Bunker Hill and Breed’s Hill. The colonists constructed a strong redoubt on Breed’s Hill to make sure no one passes the wall, as well as smaller fortified lines were spread across the Charlestown Peninsula. In this image that was painted in 1897, it shows the battle of Bunker hill that was on June 17 1775. This map shows Charles River with one side Boston and another side Charlestown. Here it is showing a video that is 1 minute and 40 seconds of the Battle of Bunker Hill that took place in Bunker Hill. The Battle of Saratoga (September 19 to October 7, 1777) marked the climax of the Saratoga campaign giving a decisive victory to the Americans over the British in the American Revolutionary war. The British General John Burgyne led a big invasion army up the Champlain Valley from Canada, hoping to meet a similar force marching northward from New York City; the southern force never arrived, and Burgoyne was surrounded by American forces in upstate New York. Burgoyne fought two small battles to break out. They took place eighteen days apart on the same ground, 9 miles on south of Saratoga, New York. Both of the battles failed. Trapped by superior American forces, with no relief in sight, Burgoyne surrendered his entire army on October 17. In here it is showing the British troops with John Burgoyne surrendering at Saratoga on October 7 1777. Following the British that went defeated at Saratoga in 1777, and French entry into the American Revolutionary War in the early’s 1778, the British decided to renew a “southern strategy” to win back their rebellious North American colonies. This campaign began in December 1778, and gained further ground in January 1780, when General Sir Henry Clinton led an army and captured Charlestown South Carolina. Clinton returned to New York in the summer of 1780, leaving Lord Cornwallis the task of fortifying (making another strong wall) the South and raising the anticipated large numbers of Loyalists. Most of the Continental Army in the south had surrendered at Charleston, was completely driven from South Carolina in the May 1780. Here it is showing the map that the British troops had when they were planning the attacks in Camden. On October 14, 1780, George Washington chose Nathanael Greene to be commander of the Southern Department of the Continental forces. Greene’s task was a hard one. The Carolinas had been the scene of a long string of disasters for the Continental Army in 1780, the worst being the capture of one American army at the Siege (battle) of Charleston and the destruction of another battle at the Battle of Camden. A victory of Patriot militiary over their Loyalist counterparts at the Battle of Kings Mountain in October had bought time, but most of South Carolina was still occupied by the British troops. When Greene took command, the southern army numbered 2307 men (on paper, 1482 present), of whom just 949 were Continental regulars. 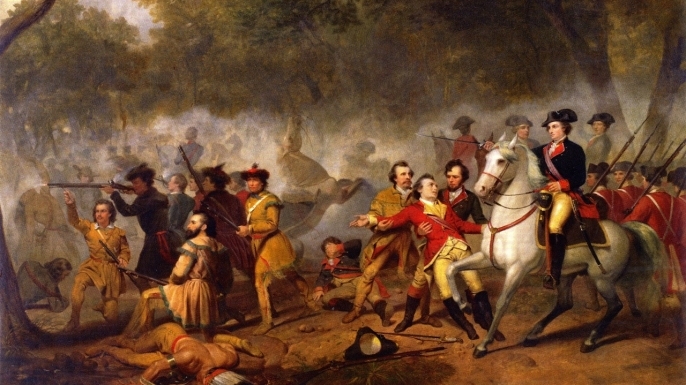 In this image on the scene depicts an unnamed black soldier (left) firing his pistol and saving the life of Colonel William Washington. The Siege of Yorktown, also known as the Battle of Yorktown, the Surrender at Yorktown or the German Battle, starting on October 6 1781, and ending on October 19, 1781. At Yorktown Virginia, was a decisive victory by a combined force of American Army troops led by General George Washington and French Army Troops led by the Comte de Rochambeau over a British Army commanded by British lord and Lieutenant General Charles Cornwallis. 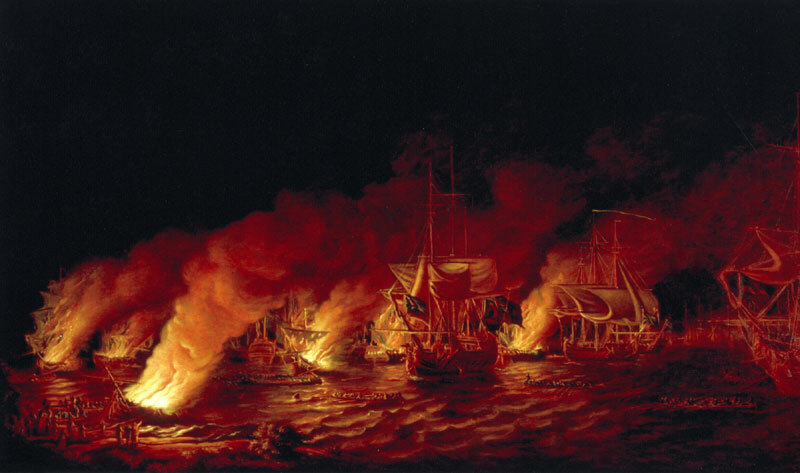 The culmination of the Yorktown campaign, the siege or battle proved to be the last major land battle of the American Revolution in the North American theater. The surrender by Cornwallis, and the capture of both him and his army, prompted the British government to negotiate an end the war to the conflict. The battle boosted faltering American morale and revived French enthusiasm for the war, as well as undermining popular support for the conflict in Great Britain. In here it is showing the British Major General Charles Cornwallis, 1st Marquess Cornwallis (1738-1805) (who was not himself present at the surrender), surrendering to French and American forces after the Siege of Yorktown (September 28 – October 19, 1781) during the American Revolutionary War. In this image it is showing Yorktown river between Yorktown and Gloucester point, and where the British surrendered. Britain agreed to recognize American independence Britain gave Americans fishing rights to the Grand Banks off the coast of Newfoundland Britain granted U.S. all territory between Mountains on the east and Alleghen y Mississippi River on the west. The Treaty of Paris, signed in France by representatives of King George III of the UK and representatives of U.S. on September 3, 1783, they ended the American Revolution. 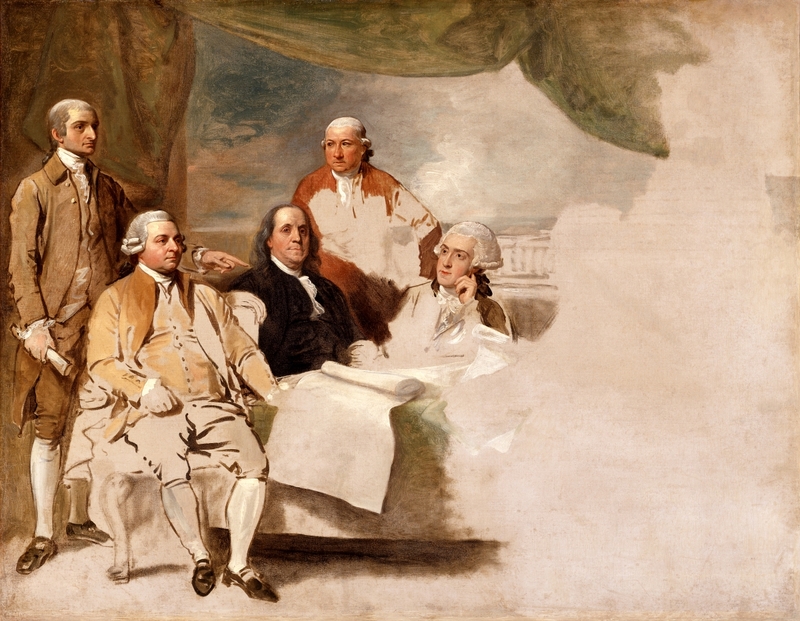 Here it is showing the Treaty of Paris with George III ending the American Revolution war, this was painted by Benjamin Franklin. It outlines the structure and powers of three branches of government are governmentseparate, balanced off by the power of the other two U.S. Constitution is supreme all persons are equal before the law people can change the constitution. Since the Constitution came into force in 1789, it has been amended 27 times. In general, the first ten amendments, known as the collectively as the Bill of Rights, offered specific protections of individual liberty and justice and place restrictions on the powers of government. 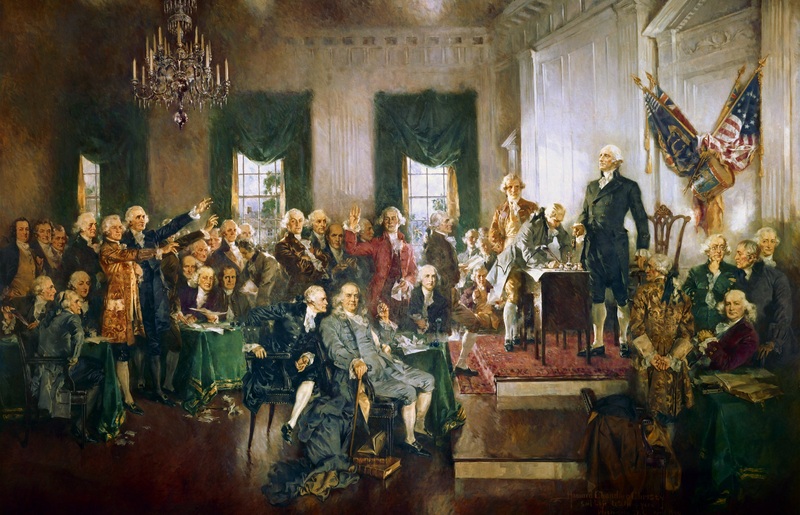 In this painting it is showing the signing of the constitution in September 17, 1787 before the real constitution. The first 10 amendments (additions) of the constitution represent ideals regarding individual liberty, limited government, and the rule of law. The Bill of Rights is the name for the first 10 amendments to the Constitution. Proposed following the oftentimes bitter from 1787 to 1791 battle over ratification of the U.S. Constitution, and crafted to address the objections raised by Anti-Federalists, the Bill of Rights amendments add certain safeguards of democracy and specific guarantees of personal freedoms and rights, clear limitations on the government’s power and other proceedings, and explicit declarations that all powers not specifically delegated to Congress by the Constitution are reserved for the states or the people to the Constitution. 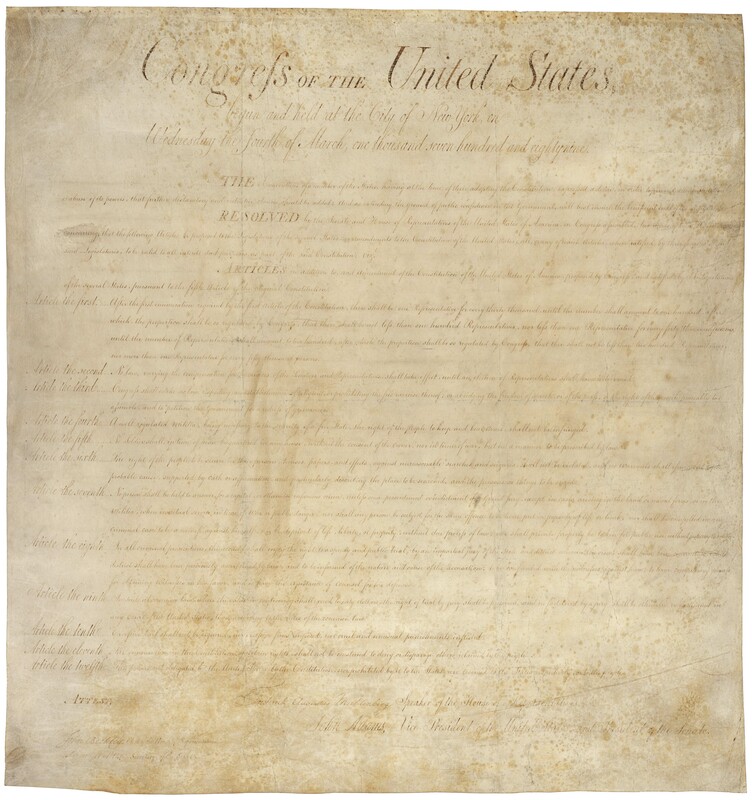 The Bill of Rights, 12 articles of amendment to the to the United States Constitution proposed in 1789, 10 of which, Articles 3 through 12, became part of the United States Constitution in 1791. Causes: Charles did not rule according to the law 1625-1642. Charles I did not rule according to the law because in the past 16s England he was a tyrant and was cruel to people. Lenthall kneels to Charles during the attempted arrest of the Five Members, painting by Charles West Cope in the Houses of Parliament on January 4th 1642. In England in 1643 there was an agreement between the Scottish Covenanters and the English Parliamentarians in the civil war. This is the paper of the agreement between the Scottish Covenanters and the Parliamentarians in the civil war. Components: Solemn League and Covenant September 25 1643, Battle of Naseby June 14 1645, Charles I escapes December 1647. Then came the battle of Naseby in June 1645.Charles army was destroyed by the parliamentarian new model army and retreated. Here it shows the new model parliamentarian army destroying Charles I’s army on June 14th 1645. Consequences: Execution of Charles January 30 1649. In 1649 it was the execution of Charles I, Parliament decided to execute Charles I on January 30 1649 because Parliament knew that if Charles I was still alive he would make more trouble. When the time came, all the people that are close to Charles I’s castle, they came to watch the King die and be happy that his tyrant troubles are over. They all saw him die by a hooded man chopping his head off and at the end showing all the crowd the king’s head. Here it shows the execution of Charles I where his head is shown up at the crowd in January 30th 1649. The so-called Rump Parliament was not intended to be a permanent body. It regarded itself as an interim government with responsibility for preparing the way for a new representative to govern the English Commonwealth. 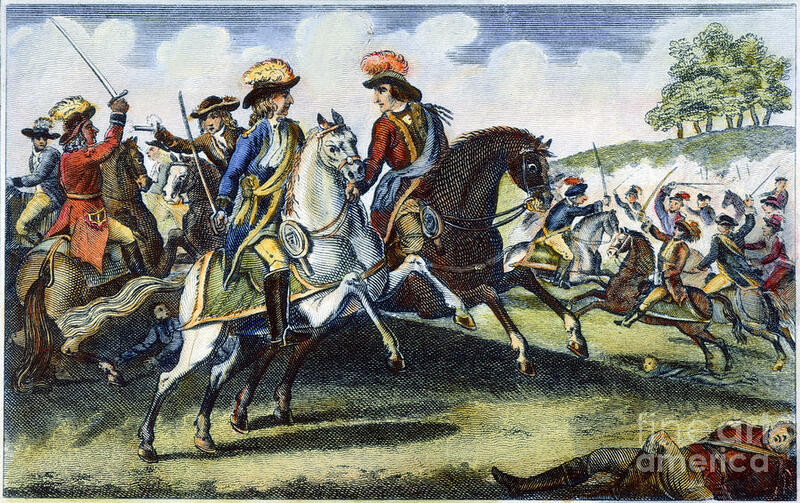 Oliver Cromwell’s decisive victory at the battle of Worcester in September 1651 ended any direct Royalist military threat to the Commonwealth and it was expected that elections would soon take place. However, Parliament was divided over the form that the new representative should take. Sir Henry Vane and his supporters proposed a redistribution of constituencies but with sitting members of the Long Parliament retaining their seats and further “recruiter” elections to fill the vacant places; Oliver Cromwell and the Council of Officers criticised Vane’s scheme for promoting the self-interest of sitting MPs and demanded a general election for an entirely new Parliament. In this picture it shows Oliver Cromwell getting ready to talk with the English Republic on April 20th 1653. According to Peters the blue laws “were never suffered to be printed”, but especially in the 19th century they were confused with the Code of 1650 of the colonists of Connecticut and with the statutes drafted in 1655 by Governor Theophilus Eaton for the then unconnected Colony of New Haven, for which he drew on the writings of the Reverend John Cotton and the laws of the Commonwealth of Massachusetts, and which were printed in London in blue covers for the use of the colonists. On the 1660s, people in England were starting to get mad, sad, and pissed off by the Blue Laws. So when Charles II heard about the country hating the Blue Laws he started to eliminate them on the 1st of December 1660, which made him never put those laws again or else it could be worse that what happened to Charles I.
Charles II is with his staff and telling his generals for an announcement that he will be eliminating the blue laws on December 1st 1660. In 1678 Parliament passed a Test act to prevent catholic people sitting on parliament. Initially, the Act did not extend to peers; but in 1678 the Act was extended by a further Act (30 Car. II. st. 2) which required that all peers and members of the House of Commons should make a declaration against transubstantiation, invocation of saints, and the sacrament of Mass. Here it shows Parliament passing the Test Act that on January 1678. The second surviving son of Charles I, he ascended the throne upon the death of his brother, Charles II. Members of Britain’s Protestant political elite increasingly suspected him of being pro-French and pro-Catholic and of having designs on becoming an absolute monarch. When he produced a Catholic heir, the tension exploded, and leading nobles called on his Protestant son-in-law and nephew William of Orange to land an invasion army from the Netherlands, which he did in the Glorious Revolution of 1688. James fled England (and thus was held to have abdicated). He was replaced by his eldest, Protestant daughter Mary and her husband William of Orange. James made one serious attempt to recover his crowns from William and Mary when he landed in Ireland in 1689. After the defeat of the Jacobite forces by the Williamites at the Battle of the Boyne in July 1690, James returned to France. He lived out the rest of his life as a pretender at a court sponsored by his cousin and ally, King Louis XIV. Rochester, once amongst James’s supporters, turned against him by 1688, as did most Anglicans. The Glorious Revolution, also called the Revolution of 1688, was the overthrow of King James II of England (James VII of Scotland and James II of Ireland) by a union of English Parliamentarians with the Dutch stadtholder William III of Orange-Nassau (William of Orange). William’s successful invasion of England with a Dutch fleet and army led to his ascending of the English throne as William III of England jointly with his wife Mary II of England, in conjunction with the documentation of the Bill of Rights 1689. Here we have James II abdicating to the English throne on December 16th 1689. Dear Mr. Lepore, if you had read this or you are just looking at my English timeline iv’e wrote this letter at the bottom of my timeline and I wanted to tell you that finding this images took me 1 h and 45min to find on March 1st, I have tried my best to finish this hard working timeline. PS: You could have warned me at the beginning that iv’e needed to put 10 images.